Tweets used to come from birds. Posts were what held up the fence. You used to “share” your cookies at lunch and “pin” papers to your bulletin board. Social media has changed those words, and social media has become a key way in promoting Sunnyside Christian School. Because your friends are listening to you, we’d like to encourage you to use your Facebook time, your tweets, and your pins to help us promote Sunnyside Christian. After all, what they hear is more important than what they hear from us! Like our Facebook page by clicking this link. Tag us in your pictures and status updates! Using the “@” before typing “Sunnyside Christian” will allow you to tag us in your updates. For example, “I really enjoyed the K-8 chapel at @Sunnyside Christian today!” You can also put a location on your pictures, so make sure and use that for SCS! When SCS shares a blog post, Photo Friday, or another announcement, share it on your wall! The “share” link is found right next to the “like” and “comment” buttons. This will help us reach many more people and allow those people to see the culture of SCS! Don’t use Facebook to vent your frustrations. Life isn’t always perfect at Sunnyside Christian. We know that. But a phone call or visit to the teacher or principal will be far more effective. We don’t want a potential family to hear negative rumors on Facebook and decide against sending their child(ren) here because of those bursts of frustration. It states in our Parent Handbook that conflicts resolution should be handled like in Matthew 18: 15-17. Jesus encourages us to deal with our problems face to face. If that doesn’t work, then to get help from a friend (or principal). Follow our Twitter feed by clicking this link. Positively promote your activities with Sunnyside Christian. Talk about what your kids are learning about, what they tell you about after school, what you’ve enjoyed about having your children enrolled at SCS, etc. Follow our Pinterest boards by clicking this link. Repin and/or like our pins. 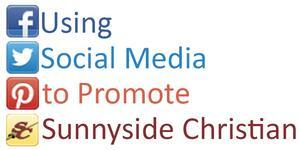 Thank you for helping us to promote Sunnyside Christian through social media! In the world of Christian education where I spend the bulk of my days, big, ominous terms such as Budget Shortage and Declining Enrollment get bantered about with the dire soberness of Walter Cronkite letting the world know that JFK just died. The economic crisis our country faces pulses through Christian schools, prompting many families to pull their kids from the private classroom and find other, cost-friendly options for education. My school, in addition to other Christian schools around the country, has been forced to grapple with the reality of classrooms that are less than full and how to keep the Bottom Line from being colored with a little too much red. Strategizing committees pour effort into how to market the school. The social media lines crackle in the effort to promote the cause of Christian education. As teachers we strive to advance the cause of Christian education, flavoring the relationships we have in the community with seasoned salt about our school. It’s a perilous time indeed for Christian schools. A time that begs the question,Is it worth it? In some regards, this may seem like the ultimate example of biting the hand that feeds you, but lean times in Christian education truly make me wonder what the Christian school has to offer that makes it worthy of its hefty price tag. It’s not solely the education. While my school instructs students well and strives for best pedagogical practices, it’s limited. It can’t offer the rigorous line-up of AP classes and specialized curricula that its public counterparts provide. It’s not simply the intimate setting. Sure, the smaller class sizes prove inviting, and the prospect of knowing each classmate’s name seems intriguing, but the simple reduced population surely doesn’t justify the tuition bill. It’s not the safe haven from the evils of the secular world. The chain-link fence outside a Christian school may thwart the intrusion of nefarious ill-meaning invaders but only provides a negligible defense against sin and the powers of darkness. Sure, the safe haven of a Christian school might insulate students from the wide-eyed evil more apparent in public schools, but the detention room at a Christian school rarely sits unoccupied. What then makes the difference? 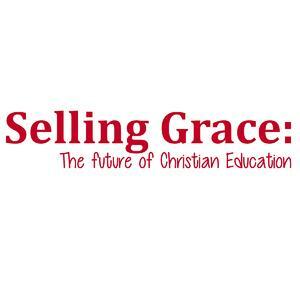 What makes Christian education both worthwhile and essential? It’s the daily experience of grace. It’s the daily audience with sold-out teachers who love the Lord and who pour that love of Christ into their lessons with the blood, sweat and tears of a struggling artist. It’s the blessed, palpable expression of Community, a community saturated and dripping with the grace of Christ, that students experience every day. It’s the living vibe, flowing through a school that every square inch of this planet belongs to God. And that seeing and owning that truth affects a person’s vision for the rest of his life. It’s the dynamic interaction of facts and faith, and the crew of talented Christ-followers who give life to that interaction every day. It’s the web of relationships, the beautiful expression of the holy church, home and school triangle, that covers and crisscrosses a Christian school and enriches the whole environment. And perhaps the extent to which Christian schools continue to exist and even flourish in the future is the extent to which they become oases of grace to the wearied pilgrims who travel this sod and seek to know the King who rules this world. Blake A. Hiemstra lives in Visalia, CA, with his wife, Carla, and 4 kids. He teaches middle school English at Central Valley Christian School. His blog is called The Write Project. Hiemstra is also the author of a book called "The Year of Living Metaphorically: Ramblings and Reflections on Life, Faith, Family and the Creatures Known as Middle Schoolers." Welcome to a new school year, and as it commences I am reminded as I interact with parents and their children of all the various emotions that are generated by this new endeavor: excitement, enthusiasm, apprehension, anxiety, and guarded optimism. Internally students have questions about both peer and teacher relationships and interactions; how is this “new” routine going to develop during the fall? And because of these uncertain challenges (as well as a number of other reasons), the SCHS staff has continued to support organizing and chaperoning a high school retreat emphasizing both the Biblical foundation of the Christian worldview taught at SCHS and building positive peer relationships which promote a strong, school community. Therefore, on Thursday, August 29, the students/staff at SCHS loaded their personal items into Mr. Sylling’s trailer and their bodies on to two busses moments before they traveled to Lost Creek Village to experience the 2013 high school retreat. As an “oldtimer” who has participated in this annual tradition, I always enjoy these two days except one detail--the very limited amount of sleep in the early Friday a.m. 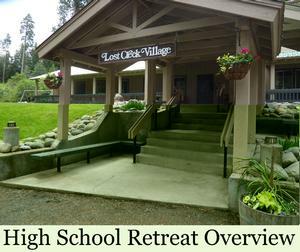 The foundation of the retreat is to glorify God by emphasizing student spiritual development. At the lodge Mr. Gene Iwami led four sessions both explaining and encouraging the students to put on the full armor of God, our SCS theme of the year. In Session One the students were challenged to define truth and to understand that objective truth exists even though our postmodern culture largely rejects absolute truth. 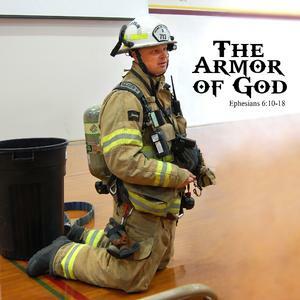 Over the final three presentations, Mr. Iwami identified the various aspects of armor identified in Ephesians 6 and encouraged all in attendance to live out God’s commands by wearing these parts of the armor. Mr. Iwami’s challenge(s) were pointed, but with God’s grace (and total dependence upon Him) and the gift of the Holy Spirit, we can forward our sanctification. In addition to the focused sessions, the students also participated in numerous activities/games organized by Ms. Candice Bosma and the Student Council. I thank them for their hard work. And the entire retreat would not function well without the excellently prepared food/snacks; our cooks, Tammie Laverman, Hester Groeneweg, Laura Martin, and Brenda Prins crafted delicious meals with enough food for all. Once again, the students/teachers/cooks experienced an inspirational challenge to the beginning of a new school year. Let us put on God’s Armor as we obediently walk through this year. Welcome Back! It’s hard to believe summer is finished and school is back in session. It seems the older I get, the faster time flies. Lots of exciting things are happening at SCS this year. I invite you stop in sometime and check out the classrooms, or just sit and visit for awhile. Chad compared the belt with the suspenders that hold up his fire pants. If he did not have his suspenders, his pants would fall to his ankles and trip him as he worked. Similarly, we need the belt of truth so we know the difference between truth and lies; we do not want to be tripped up in untruth. A fireman wears his coat for protection. Even though it is hot and usually uncomfortable, the coat provides the protection needed for the job to get done. Sometimes what is right is not comfortable, but necessary. Chad also addressed the students, letting them know that if they look around and see that others aren't wearing their "gear," that it doesn't give them an excuse to take theirs off. We always have to be ready for what life gives us. If we get caught without our gear on, we will be in danger. Also included in the fireman's breastplate is his oxygen tank. In order to accomplish their task of addressing and defeating the fire, firefighters need clean air. We also need righteousness to address this world and our daily lives. Chad began his talk with putting on his fire boots. He emphasized that in order to put on his fire boots, he had to take off his normal shoes. Much the same, we need to take off the old self and put on the new. Those "flaming arrows" got Chad excited about using his fire analogy! Chad explained how firemen, when they arrive at the scene of a fire, place their “passport” or name in the captain’s book so he knows who is at the fire. This is similar to having our names in God's Book of Life. Chad showed us his fire helmet. He demonstrated the importance of the helmet to protect his head. The firefighter helmet is the perfect analogy for Jesus. Jesus absorbs all the dangerous blows from the world that we deserve. Chad used his hose as an analogy to this sword. As the breastplate is designed to protect, so is the water that flows from the hose. He explained how the hose can be used offensively or defensively to fight fires and protect firemen. The important thing to remember is that it must be attached to a water source to be useful. We must be attached to our source, Jesus, also. This was his equation: hose = faith / water = grace. While firefighters are working on a fire, they always have their radios with them. They must be in communication at all times with their leaders and other firefighters. We need to be in communication with God always about what's happening in our lives and on behalf of each other. A firefighter also has pads on their knees because they spend so much time kneeling. Being on their knees keeps their heads clear of debris and smoke. Chad related crawling through a fire to being on our knees in prayer. Being on our knees humbles us, keeping us further from harmful debris and smoke. I could go on and on because we had a wonderful beginning chapel. May your school year be blessed with God’s strength, truth, wisdom, protection, and direction as you clothe yourself with His armor.